Lately there's been some interest in the few Camiva TLs that saw service in the UK, particularly from a certain Mr Johnson! Well this one's for you, Rob. It does really look the part! PS: I like the side view too - interesting controls. Added by Rob Johnson on 23 May 2018. See also the comments at picture #6060. A TL walking sounds alarming. Added by Petros on 24 May 2018. To be fair, the walking problem was probably Bedwas fault - whoever they were! But the Camiva was not all that successful anywhere. Added by Rob Johnson on 25 May 2018. 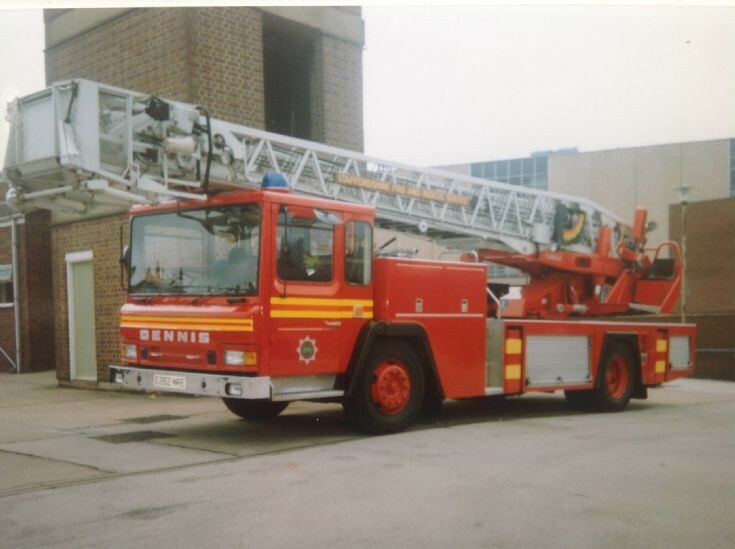 There were 8 in total Turntable Ladders using the French CAMIVA Equipment and all were based on Dennis F27 chassis bar North Yorkshire's who's was Scania based. London Fire Brigade took the most examples who had 4 units with the other 4 going to Staffordshire, Devon, Merseyside and as mentioned before, the Scania chassied vehicle to North Yorkshire. These were problematic ladders by all accounts, and probably did nothing to help Dennis's reputation. There was another machine with Cheshire, this being a 1987 Scania Aerial Ladder Platform equipped by Carmichael with a Finnish Bronto Skylift Boom that was having regular trouble with the Ladders as well as braking down frequently, one classic example being immobilised to a big fire in Sandbach 28 miles away in the early hours of Sunday 24 September 1995 when it broke down en-route to the fire. E717SON was based at Chester and is now a reserve machine in New Zealand. Added by Michael Earith on 06 March 2019.